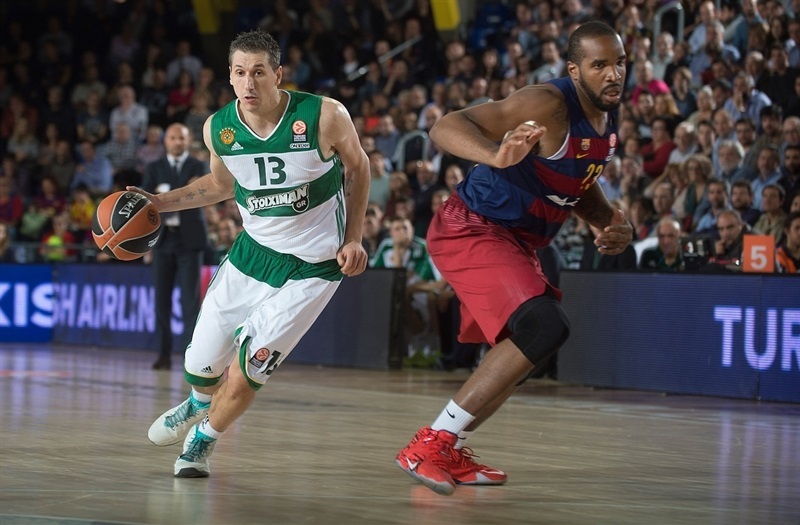 In a showdown between Turkish Airlines Euroleague giants, FC Barcelona Lassa grabbed its second consecutive win in Group C by downing Panathinaikos Athens 77-52 at home on Thursday. 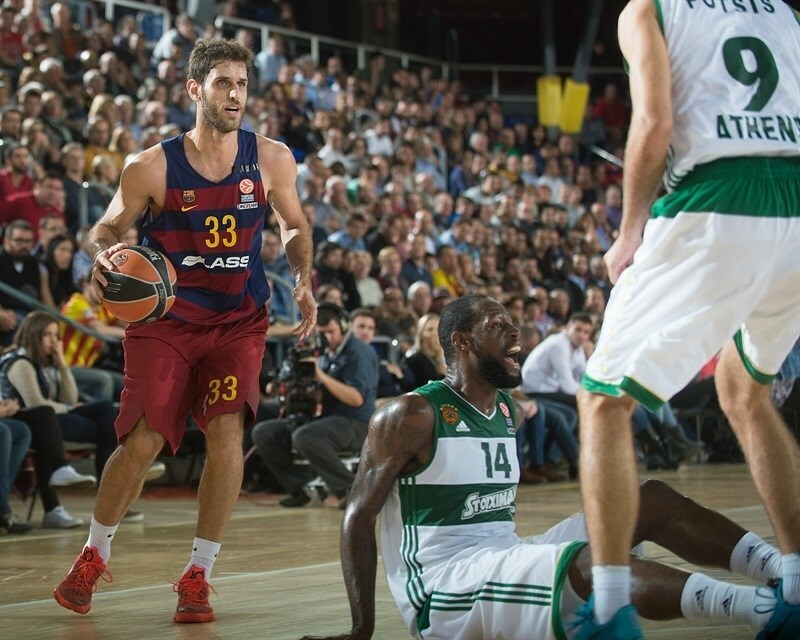 Barcelona improved to 2-1 while Panathinaikos dropped to 1-2. 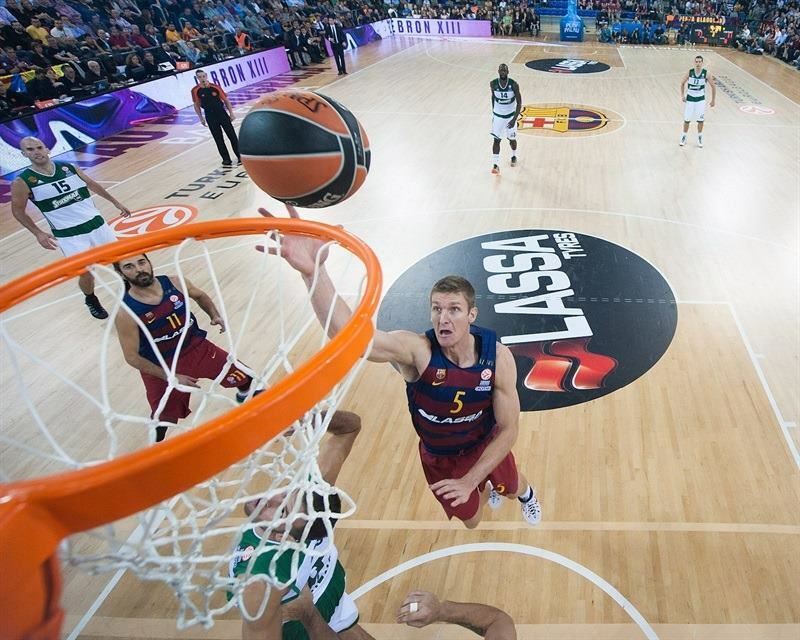 Justin Doellman led a balanced Barcelona attack with 13 points and 6 rebounds, while Ante Tomic, Stratos Perperoglou and Alex Abrines added 11 points each. 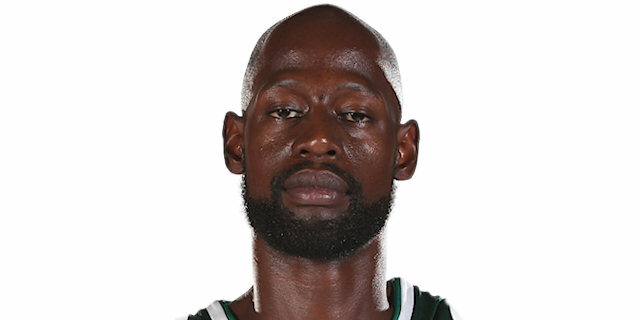 James Gist led the Greens attack with 13 points and James Feldeine scored 11 in defeat. An outstanding Perperoglou shined early, getting help from Tomas Satoransky and Shane Lawal to give Barcelona a 17-11 lead after 10 minutes. A fast break slam by Abrines boosted the hosts' lead to 25-13. Carlos Arroyo and an unstoppable Doellman soon made it an 18-point game, but Panathinaikos lowered its deficit to 42-28 at halftime and then again to 42-35 soon after the break. 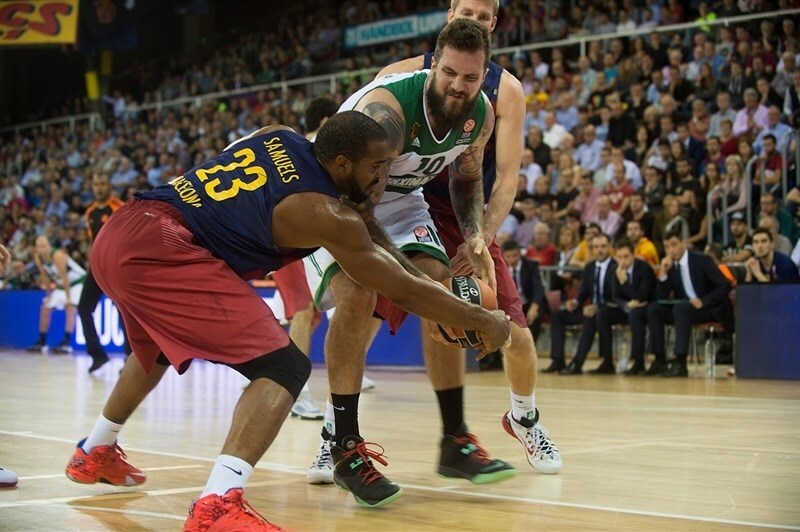 Tomic and Perperoglou stepped up for Barcelona, giving their team a 55-43 margin after three quarters. Nothing changed after that, as Barcelona boosted its margin to 64-44 on a wild three-point play by Samuels and the hosts never looked back. A moment of silence took place before the game in memory of the late Ranko Zeravica, who passed away earlier in the day. Zeravica coached Barcelona from 1974 to 1976 and led Yugoslavia to respective gold medals at the 1970 FIBA World Cup and the 1980 Olympic Games. Barcelona started the game with a twin center lineup, with Samardo Samuels and Tomic together on court. 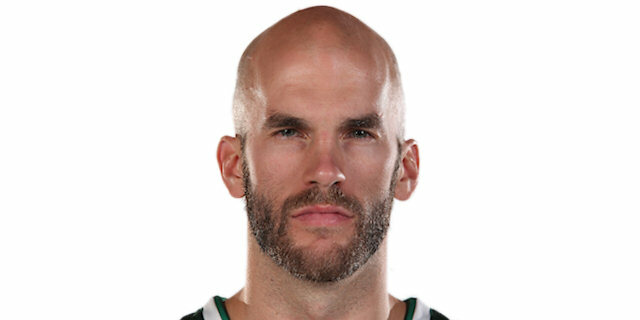 Nick Calathes got Panathinaikos going with a driving layup, which Perperoglou bettered with a three-pointer for a 3-2 Barcelona lead. 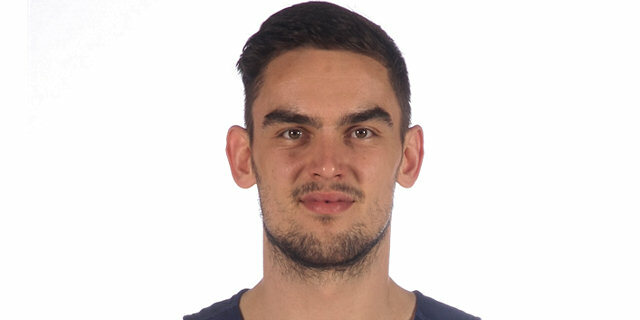 Gist stepped up with a fast break slam, but Perperoglou insisted from downtown and Tomas Satoransky added a jumper that gave the hosts an 8-4 lead. Panathinaikos kept struggling to score until Calathes stepped up with a backdoor layup. The Greens tried to improve their ball circulation with Calathes and Dimitris Diamantidis together on court. Tomic made free throws and a three-pointer by Vasilis Charalampopoulos brought Panathinaikos within 10-9. 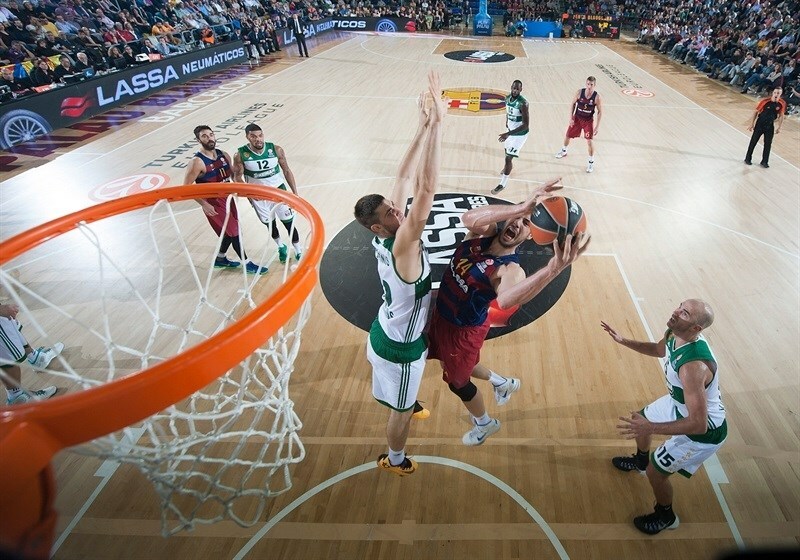 Tomic scored down low and a coast-to-coast layup by Perperoglou boosted Barcelona's lead to 14-9. After Satoransky split free throws, Feldeine hit a one-handed floater. A layup by Shane Lawal gave the hosts a 17-11 lead after 10 minutes. Doellman made free throws early in the quarter, but Gist quickly answered with a big basket in the low post. 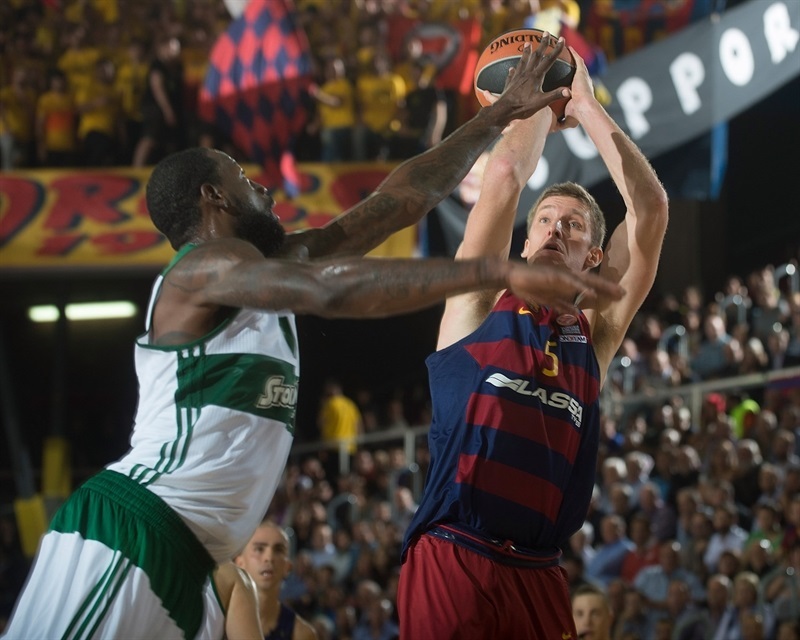 Doellman swished a rainbow jumper, which Juan Carlos Navarro followed with a driving layup for a 10-point lead. Alex Abrines took over with a wild fast break slam and Doellman added a baseline jumper for a 27-13 Barcelona lead, after an 8-0 run. Feldeine tried to change things with a close basket and free throws by Miroslav Raduljica brought the Greens within 27-17. Carlos Arroyo punished the guests' 2-3 zone defense with a three-pointer. Raduljica scored down low off a Panathinaikos timeout, but Arroyo downed another triple and Brad Oleson added a reverse layup that broke the game open at 35-19. Raduljica kept pacing the Greens with a three-point play, Doellman struck from downtown and a jump hook by Tomic made it 40-22. Gist hit foul shots and Calathes erased Doellman's close jumper with a reverse layup. A buzzer-beating layup by Antonis Fotsis fixed the halftime score at 42-28. Feldeine struck from downtown immediately after the break and a fast break dunk by Gist brought Panathinaikos within single digits, 42-33. Barcelona was held scoreless for more than two minutes and an up-and-under layup by Sasha Pavlovic made it a 7-point after an 0-11 run. 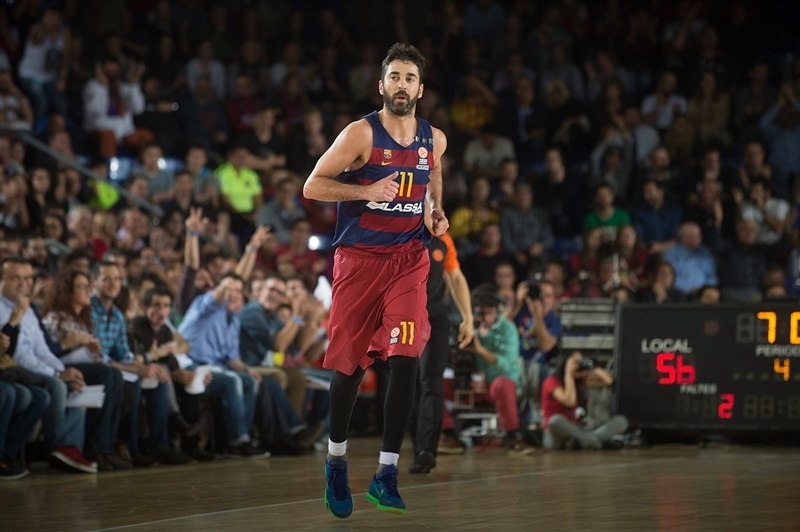 Pau Ribs hit a technical free throw and Tomic added a three-point play to restore a 46-35 Barcelona edge. Feldeine scored in penetration, but Tomic fed Satoransky for a backdoor layup. Calathes brought the Greens within 48-39. 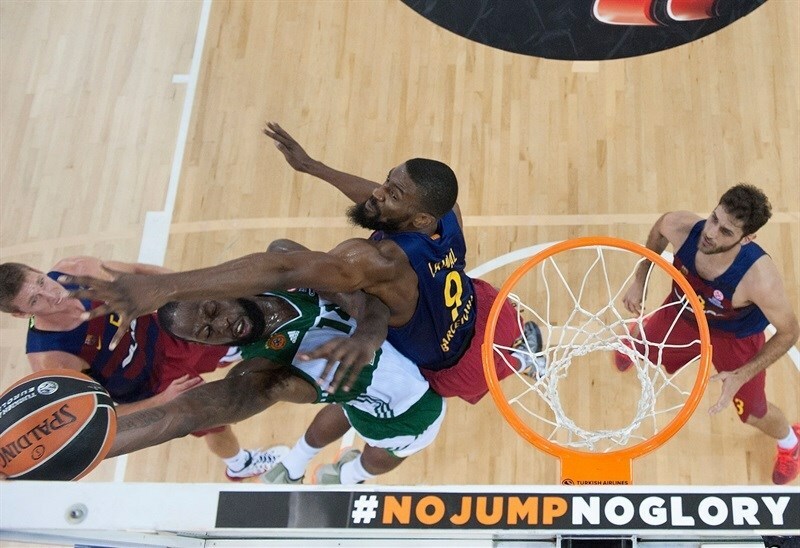 Gist dunked again, but Barcelona improved its defense off a timeout. Perperoglou rescued the hosts with a three-pointer and free throws by Navarro soon made it a 12-point game. 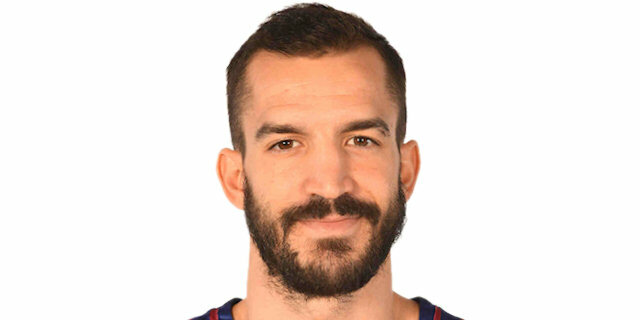 Panathinaikos tried to open the floor with Fotsis and Gist together on court, but Barcelona found a go-to guy in Samuels, who shined with a big block and a behind-the-back assist to Tomic. A floating layup by Pavlovic kept Panathinaikos within 55-43. Navarro hit a technical free throw early in the quarter and Feldeine split attempts for a 56-44 score. Barcelona tried to use longer possessions to run the game clock down, now with Arroyo and Navarro together on court. Navarro sank a stop-and-pop three-pointer and Samuels added a layup that boosted the hosts' lead to 61-44 with over six minutes left. 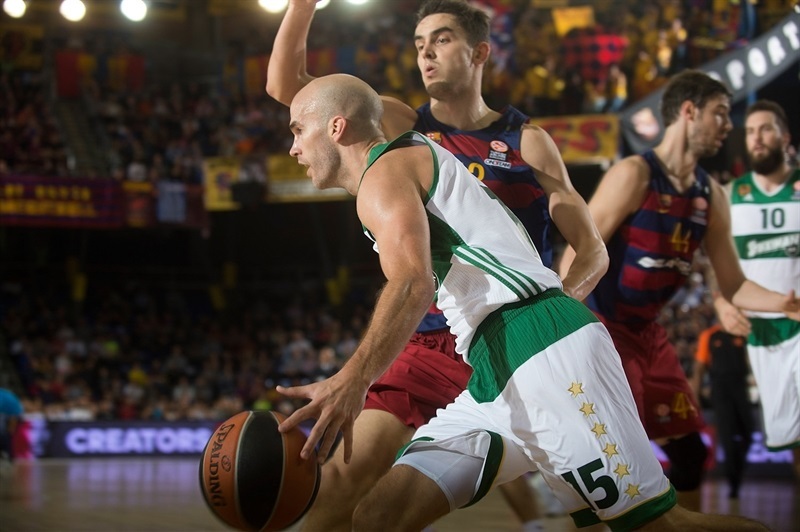 The Greens kept missing shots, as Barcelona was all over the place on defense. Meanwhile, a wild three-point play by Samuels sealed the outcome at 64-44. Both teams kept fighting. Pavlovic and Raduljica stepped up with respective baskets, but Doellman and Abrines answered to keep Barcelona way ahead, 69-48. Nothing changed in the final two minutes, as all Barcelona fans celebrated a well-deserved and very convincing home win. "First of all, thanks for our fans at Palau Blaugrana for their support in an important game - they helped us a lot. I think they had a good time watching us win. We won by many points and were at a very good defensive level all game long. Offensively, we stopped in the third quarter, didn't circulate the ball well but in general terms, we played an all-around game. We lacked a better offensive rhythm in the second half but played well in general terms. We found open three-point shots due to good ball circulation. We played against a team with good defense, its own identity and we must give credit to them for stopping us early in the second half. We are growing as a team, trying to do things better every day. We prepared the game well and did well on defense. I would have liked to score more points but we played a good game and it was a good win. Every game is different - we had an important win against a very good team. 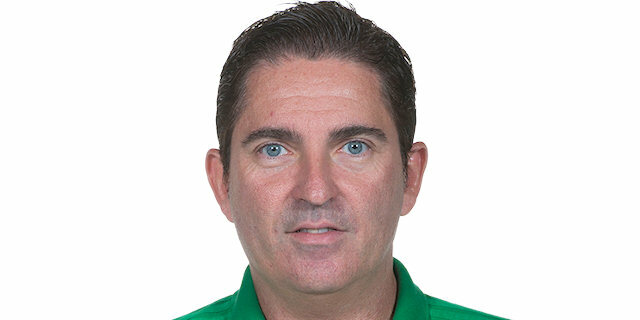 Not having Ognjen Kuzmic was a big loss for them but still, Panathinaikos is a very high-level team. The difference between both teams is not 25 points." "First of all, congratulations to Barcelona, they absolutely deserved this win. I cannot be satisfied at all with the way we approached this game, without a competitive attitude. It is unacceptable and I am not happy with it. We didn't show the right face to play this game. The competitiveness, at this level, has to come from inside each player. In this shape, against Barcelona in Barcelona, if you play with this attitude, this is what happens. We have to come back and I expect my plays to react the right way. We had a very tough schedule but no more excuses: the competition moves on. We had 10 players tonight, three of them very young. We could have played a better game. We got as close as 6 points a couple of times but made a lot of unforced errors and turnovers which are not at this level. The long bench of Barcelona and its energy level made an impact. In the long run, that gave Barcelona an advantage. We have to wake up, forgot about what we did in the past, who we beat and who we played against. The competition goes on, we have to focus and it is my job to make them understand that." "We played good defense all game long. It is true that we were more fluent on offense in the first half, but they played better defense in the second half, too. As long as we kept playing good defense, the game was ours. They managed to run the floor early in the second half because of our mistakes on offense but the team played good defense for 40 minutes. They have a lot of injured players. We had a bad start in the Euroleague and wanted to do better in the last two home games. We played better than last week, got two wins which give us confidence to play against Zalgiris in Lithuania. Little by little, we are getting better. We have a tough calendar but also a deep team." "Defense was the biggest key to this win. We started very well on defense and kept a high level throughout the game. They had a strong start in the second half but we kept playing good defense and that allowed us to win the game. We stopped their direct screen games, which is their main virtue on offense. This win is good for our confidence. Each Euroleague game is important, especially after losing the first game against Karsiyaka. It is going to be a very balanced group and it is important to beat a tough opponent like Panathinaikos by so many points. It is positive for upcoming games." "Barcelona is a good team. You got to come ready to play. We had a few mistakes early in the game, and got down. And against a team like Barcelona and other elite teams in the Euroleague, if you get down by 15 points, it is hard to get back. We tried to fight as much as we could with what we had. It is hard to come back if you get down by 15 points. You use all your energy to come back, and to get over that hump is also another step. But it is early in the season. We still need to learn and see where to get better. Every day, every practice we just need to get better." "We did not play how we know how to play. It was a bad game for us. Obviously, we go to play better as a team. Hopefully we can bounce back the next game."